Lone Heavy Gunner is a free shooting game for Windows 8 and 8.1 computers. You were on a mission at your home land, but your troop is no longer with you. You are the lone survivor of the enemy attack and now you have to finish what you have been assigned. Enemy is attacking your city in waves, but you have to make sure you do not let a single enemy in. Use the heavy machine gun and shoot down what approaches you. 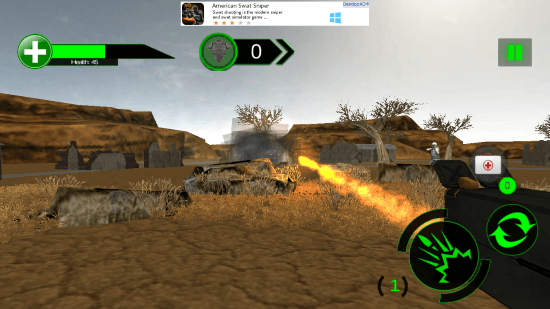 Enemy troop, heavy jeeps, and helicopters are bound to attack you in this shooting game for Windows 8. 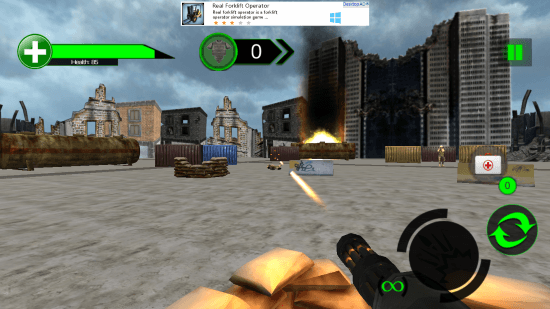 Install this FPS game for Windows 8 and get ready for some real time military action. This is an 85 MB shooting game for Windows 8, and worth every MB it occupies. Developed by ZEKAB, this game is bound to give you thrills if you love shooting games. Go to Windows App Store to find this shooting game for Windows 8. The download link is given below at the end of this review. 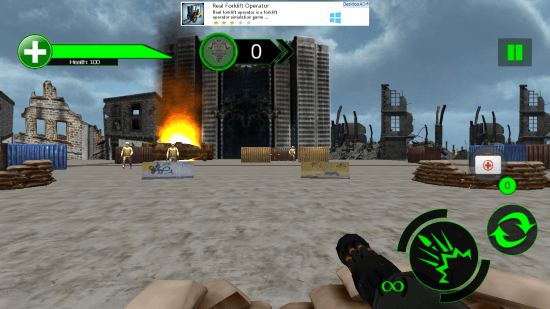 Click on Play to begin playing this shooting game for Windows 8. You can control the excellent sound and music through the options on the starting screen. After clicking Play, you will be directed to the Map screen. View various levels that are available for you to play on this screen. Yo can view the mission briefing along with the location of the place where you have been assigned. 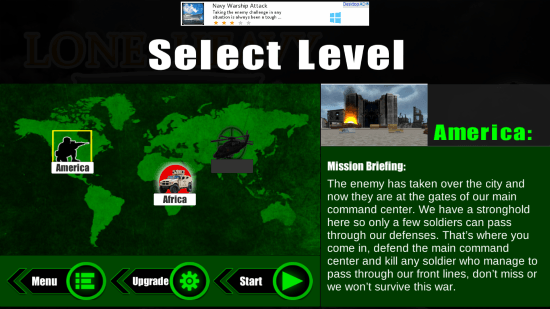 Select a level and then click on Start to begin laying this shooting game for Windows 8. Use the WASD keys or the Navigation keys to move around the gun scope to target the enemies. Click on the shooting icon available at the bottom right corner of the screen to shoot. You have got infinite rounds of ammo, so do not hesitate to use the trigger to fire as much as you can. Keep an eye on the health bar at the top left corner of the screen. 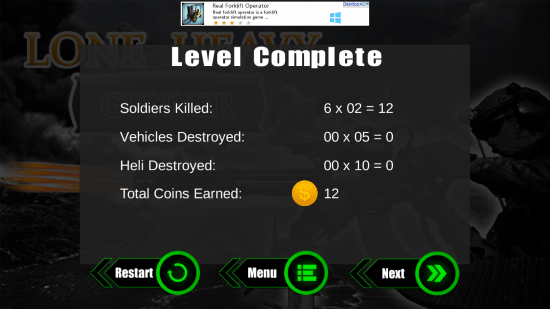 Complete a level to and view the following stats: Soldiers killed, vehicles destroyed, helicopter destroyed, and total coins earned. Use the earned coin to upgrade your weapons. Unlock the other levels of this shooting game for Windows 8 by completing the first level. The second level have vehicles attacking you along with enemies. Use the swap button to switch to RPG. Target and take down the jeep, and then kill the soldiers. The anti vehicular missile has limited ammo, so use it wisely. This shooting game for Windows 8 is full of action and surprises. Along with good visual quality, you get perfect sound effects. Download this game and unpack more action for yourself. 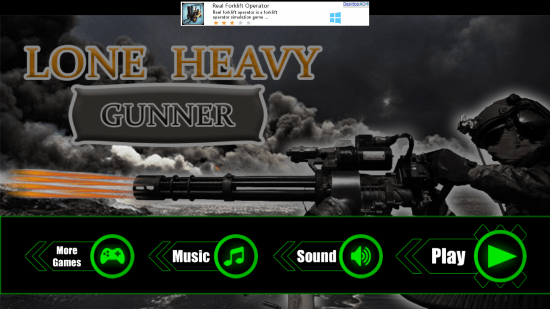 Download Lone Heavy Gunner for Windows 8 and 8.1 computers.